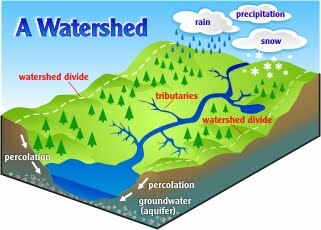 A watershed is a giant basin formed by the topography of a region. All of the water in the region drains downward from hills and mountains toward the bottom of the basin, collecting into smaller streams along the way that all feed into one central river. Every scrap of land in the entire world is part of some watershed. The boundaries are formed by the high points – mountaintops, hilltops, and ridges – around the river. 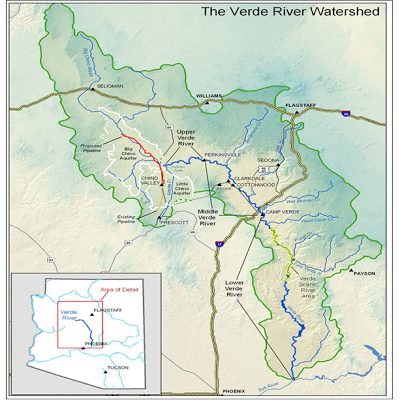 The Verde River watershed encompasses the Verde River – all 192 miles of it, from its headwaters in Chino Valley to the confluence with the Salt River – and the smaller tributaries that feed into it. 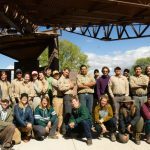 Aside from providing excellent fishing, rafting, hiking, bird- and wildlife-watching opportunities, the Verde River watershed provides the necessary water to support the growing communities along its banks. The water that you use to drink, wash everything from yourself to your dishes, water your plants, hose down your driveway, flush your toilet, and everything else that you do in your day-to-day life comes from – you guessed it – a watershed. Rain falls and replenishes the water both above ground in lakes and streams and below ground in aquifers and groundwater pools – but only up to a certain amount! If more water gets used up – by people, by evaporation, by plants and animals – than gets put back in by rainfall, then all those water sources get depleted year by year until they finally run dry. When this happens, there won’t be any water left for anyone; people will be forced to move, and plants and animals that don’t have that option will die. In some places where there is plenty of water, this isn’t too much of a concern. 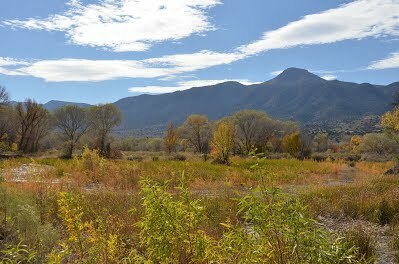 In other places (such as the dry desert of Arizona, where the Verde River watershed flows), it’s a big concern! There are few things more pleasant and beautiful than a healthy watershed. It provides a wonderful place for people to live, and supports lots of wildlife and vibrant plants as well. 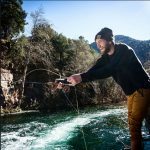 To enjoy these things, it is everyone’s responsibility to keep their watersheds healthy. Everything in your home is part of the watershed you live in, from the amount of water you use to the plants you put in your garden and yard. That means that what you do matters! 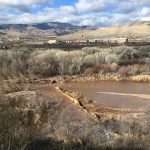 Whether you live in the Verde River Watershed or somewhere else, there is a lot that you can do to help contribute to a healthy watershed. 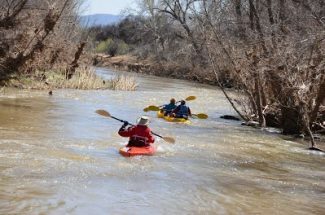 View the STORY MAP of Oasis in the Desert:Restoring the Verde River.